People change their clothes as the seasons change so why not their makeup? Whilst I like summery pinks and corals for Summer come Autumn I prefer a darker, berry shade. The one I have found myself reaching for the most this season is Nars Dolce Vita. They describe it as a 'matte dusty rose'. I'd say it contains more red than pink, it's more of a dark berry colour. It's red but not garishly so, it's pink but not girly girl so, there's a lot of depth to the colour. 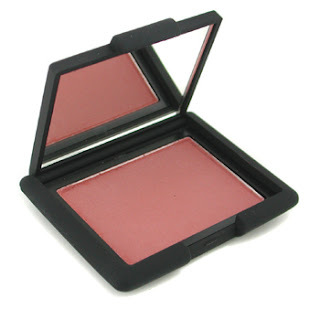 It a very versatile blush with a flick of the brush it imparts a 'just returned from a long walk in the country' barely-there rosy blush, but it can also be built up to a more dramatic plummy rosy red hue. The colour is very true to pan, which isn't the case with all products. The payoff is very rich and a little goes a long way, like most Nars blushes it is very pigmented and therefore quite effortless to apply. It has a subtle sheen that's not shimmery, if you like shimmer Outlaw is quite similar in shade just with more glitter, but also isn't too matte or flat. It gives a very natural flush to the cheeks, like you've just been indulging in some exercise *cough cough*. Whilst for those prone to redness in their skin this may not be the perfect fit I think it will suit most other skin tones really well. I apply blush by smiling into the mirror like a crazy person and buffing the powder into the apples of my cheeks. If I am feeling more adventurous I will use a light colour on this area, and a darker blush to contour (in place of bronzer). This fool proof, user friendly blush lasts about eight hours.